Premium quality sharpener ensures you never have a "dull" moment in the office, at school, or around the house! 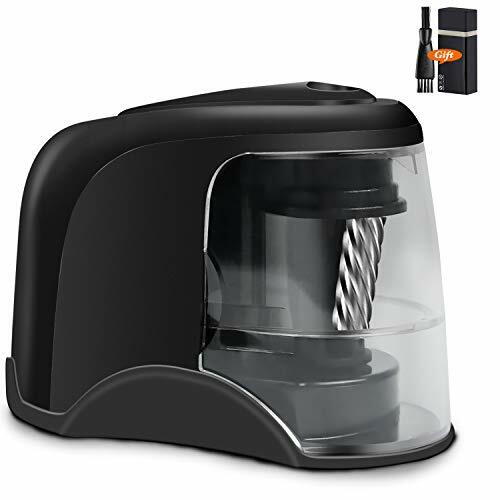 Do you need an electric pencil sharpener that can go anywhere and handle any sharpening task? Then we have exactly what you've been looking for! PowerMe has taken the time to develop the best pencil sharpener. Lightweight and compact, this automatic pencil sharpener is a great choice for the aspiring artist, driven student or working professional. It's battery powered (*batteries not included), which means you don't have to worry about finding a place to plug it in. Paired with its durability and use for various pencils, that makes it the perfect choice for you!
? Safety for your kids! - Innovative, auto-stop safety feature prevents the pencil sharpener from being used if the lid is removed. ensures the perfect point every time, never get an uneven tip. commercial use, classroom, executive use, Perfect for desktop or office atmosphere, personal & student use. 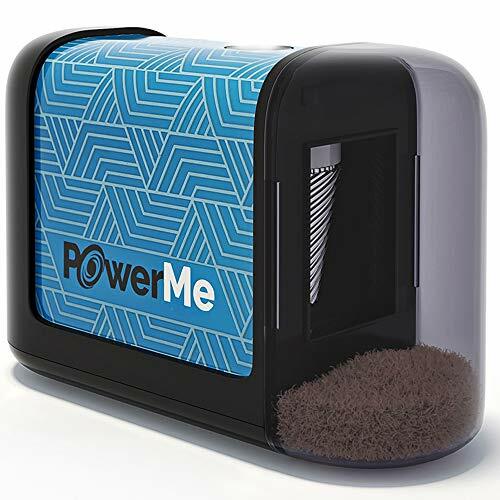 We're so sure you'll love the PowerMe electric pencil sharpener! If for ANY REASON you don't like it, please tell us about it right away and we will do whatever it takes to ensure your satisfaction! THE PERFECT CHOICE! Whether you are an artist, teacher, student, or business man, the Power Me pencil sharpener is the best choice for you, the combination between the beautiful design and the high-quality materials make it perfect for commercial use, classroom, executive use, desktop or office atmosphere. Table Mount Vertical space saving design fits comfortably on any size desk. TO LAST Crafted from high-quality materials The Power Me electric pencil sharpener gives you up to 3000 times of sharpening without wearing out, with The Heavy Duty, ultra-durable high- grade stainless steel helical blade it takes only 3 seconds to sharpen. Never replace a dull blade again! By being Compact and lightweight, you can take it where ever you need to. SAFETY FOR YOUR KIDS! - Our innovative, auto-stop safety feature prevents this pencil sharpener from being used if the lid is removed. That means no risk for your fingers, which makes it an ideal choice for classrooms with your young kids. The Large transparent Shavings Reservoir Rarely needs emptying and can be cleaned easily, simply remove the shavings tray, and empty it into a wastebasket. DESIGNED FOR PERFECTION! - Our unique rotating spiral drill design ensures the perfect point every time, never get an uneven tip. With the auto-jam release system you never get stuck pencils, simply push down on the pencil and it will be released. This Professional pencil sharpener ideal for No. 2 and Colored Pencils (Drawing, Coloring). 100% MONEY BACK - We truly want you to be happy with your electric pencil sharpener and our professional customer service will do whatever it takes to ensure your satisfaction. If you are not fully happy with the Power Me pencil sharpener, we are offering the 6-month , no questions asked. 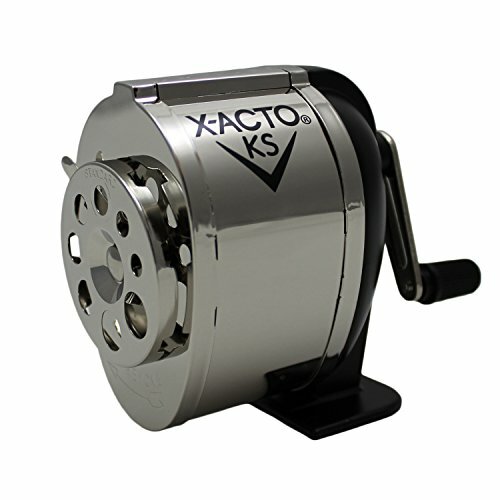 Powerful Motor With heavy-duty and durable helical blade, fast sharpening for 5-10 seconds and auto-stop working at a perfect point to protect pencil lead and dispose of the broken lead intelligently. Fit for sharpening #2 pencils, colored pencils, charcoal pencils, etc. Auto & Safety Features Automatically work when plugging the pencil into the shaving entrance. Auto-stop working if finished or the lid is opened. 8mm diameters shaving entrance could prevent kids' fingers from entering to avoid hurting. Large Capacity Design Large capacity shavings reservoir can hold a lot of shavings. Scraps will not fall out easily when the top open lid is closed. It could sharpen your pencil over 3,000 times. Easy to Clean Open the cover of the reservoir to pour out the pencil shavings when finished, not adding too much trouble. Our product provides Lifetime Guarantee, please contact us to get it fixed if it damages during the use. 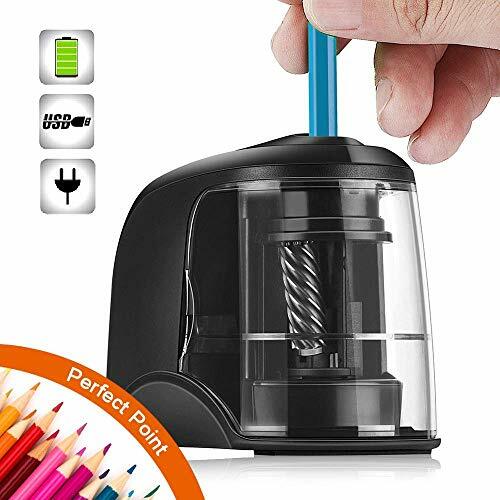  Auto Safe Sharpening - Electric pencil sharpener start working when pressing down the pencil and will auto stop working at a perfect point or release the pressure on the pencil.Fit for 6-8mm diameter #2 pencils, colored pencils, charcoal pencils, etc.  Fast Sharpening & Time Saving - The electric sharpener with premium quality blades which is good enough to produce a well-sharpened point. only 5 seconds to sharpen, giving you a stunning shave experience.Specially designed for kids, students, teachers, artists, engineers, industrial designers, etc. 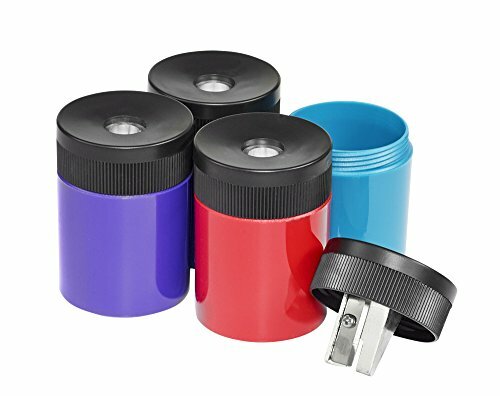  Multiple drive - The battery operated pencil sharpener can be powered by 2 AA batteries or USB cable, convenient to use when connect with power bank, laptop etc.  REPLACEMENT GUARANTEE - Guarantee 60 days money back: We want to offer you the best products as well as a comprehensive customer service and a corresponding shopping experience. If you are not satisfied with our products, we will gladly take them back within 2 months of purchase for a full refund of the purchase price or in exchange for another product. 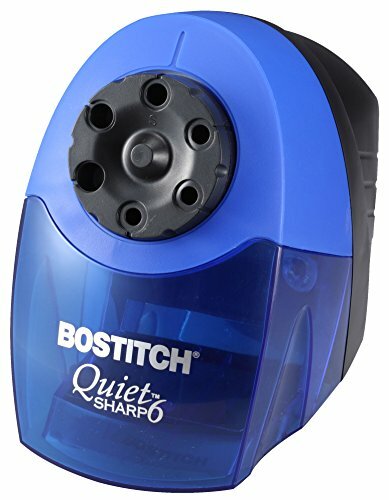 Stanley Bostitch Compact Electric Pencil Sharpener Blue. This is not a Battery Operated item. Clean the pencil box regularly. If the pencil box is full of shavings, the sharpener might not be able to function properly. Remove the batteries when cleaning or emptying the pencil box. Don't remove the shavings with your fingers directly. Don't clean the pencil sharpener with corrosive materials. Keep the sharpener clean and dry to avoid any problems. USB or Battery Powered: Our electronic pencil sharpener is powered by 2 AA batteries(Not included) or standard USB cord. To avoid the potential insecurity of plug-in for kids, the adapter is not included, but it is highly recommended that a 5V 1000mA adapter is used to get more strong power, which provides strong power sharpens for your pencil to a nice point only in 6-10 seconds. Kids-Friendly And Safe: The pencil sharpener stops working when the shaving tray is removed. The safe lock prevents kids from hurting their fingers when using alone. Space-Saving: The compact design and proper size make the Pencil Sharpener be a real space saver. It is also very portable, you can take it easy without any burden and hassle. The pencil sharpener comes with a sharp built-in blade, which is powerful enough to give a fine point for No. 2 pencils or colored pencils. Do hold the pencil with your hand to sharp after it's powered. This is not designed for not for crayons and eyebrow pencil. 30 days unconditionally refund or free replacement in case of defective or any quality problems, life-time friendly customer service. Bring it with you on the go or keep it charged at your desk with the INCLUDED BATTERIES and AC ADAPTER. Designed for use with #2 pencils, colored pencils, charcoal pencils, drafting pencils and more. A convenient auto-stop function instantly stops the sharpening blade when the shavings tray is open, keeping users safe. Easily switch between blunt, medium and sharp settings. Sharpen worry-free with our lifetime warranty. If you have any issues with our sharpener, we will gladly replace it at no cost to you! The Blackwing Long Point Pencil Sharpener creates the perfect point using a two-step sharpening process, first sharpening the wood and then precision sharpening the graphite core to a long, fine point. Every sharpener comes with two replacement blades and an automatic brake that prevents over-sharpening, and the sharpening reservoir catches pencil shavings and graphite dust. Blackwing pencils were first introduced by the Eberhard Faber Pencil Company in the 1930's. Their cult following included John Steinbeck and Chuck Jones, who proudly used Blackwings to create Bugs Bunny and many other Looney Tunes characters. Over the years, the pencil with the unique rectangular eraser became synonymous with quality. However, due to cost cuts, they were discontinued in the 1990's. That didn't stop devotees from paying as much as $40 per pencil for unused stock. In 2010, we drew from nearly a century of experience to access the best materials in the world and bring Blackwing and its accessories back for a new generation of writers, musicians, and others seeking a more natural existence. TOOLS WITH HERITAGE - First created in the 1930's, Blackwing built a cult following that included John Steinbeck and Chuck Jones, who proudly used Blackwings to create Bugs Bunny and many other Looney Tunes characters. Discontinued in the 90's, we revived the Blackwing brand in 2010 for a new generation of writers, musicians, and others seeking a more natural existence. TWO STEP SHARPENING PROCESS - Our unique pencil sharpener uses a revolutionary two-step sharpening process for a better point. The Blackwing Long Point Pencil Sharpener does this by sharpening the wood first and then the graphite core to make a long, fine point that resists breakage. AUTOMATIC BRAKES - Every sharpener comes with two replacement blades and an automatic brake that prevents over-sharpening so that your Blackwing pencils last longer. 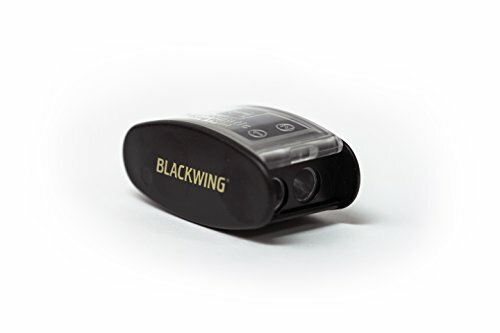 COMMITMENT TO QUALITY - Blackwing Long Point Pencil Sharpeners are made with high quality German stainless steel blades and heavy-duty plastic, for the finest construction available. HOW WE GIVE BACK - A portion of the sales from all Blackwing products benefit the Blackwing Foundation, which funds and develops arts and music education at the K-12 level. Your purchase helps provide, among other things, the instruction, learning environment and instruments children need to participate in the Little Kids' Rock Modern Band Program. 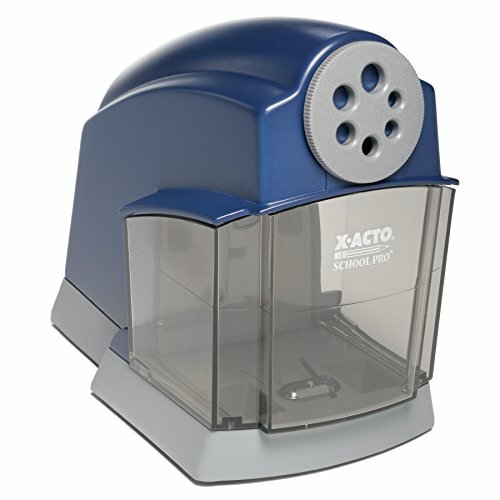 Built with today s classroom in mind, this sharpener will help students sharpen their pencils quickly, quietly, and safely. And it ll help teachers get back to teaching! To ensure safety in the classroom, the tamper proof MagnaSafe shutoff technology smartly prevents operation when the shavings tray is removed. So, if the tray is removed, there s no way to get the motor to run. This makes it the standard for safety in a classroom environment with young children around. This sharpener is the perfect addition to any classroom! 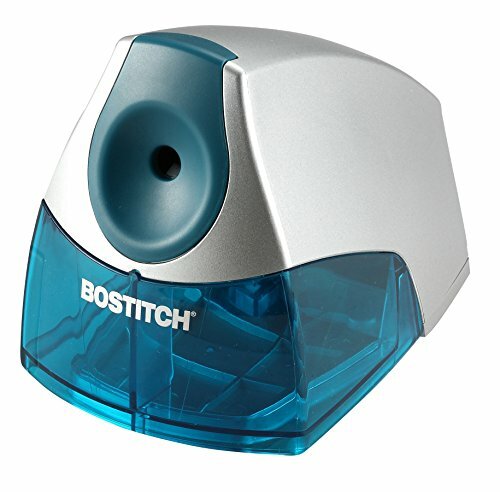 Bostitch Office also offers a 7-year warranty on this awesome sharpener. Have the peace of mind of knowing that if anything goes wrong, you know you can always trust Bostitch to get you back in business! The Bostitch Warranty has been trusted for decades and we aren t going anywhere! Please don't stick anything up your nose . . . except maybe your pencil. This funny pencil sharpener is just gross enough to make it irresistible to kids and some adults! Nose sharpener measures approximately 2.5" high x 2.25" wide x 1.5" deep. Great for kids" school supplies or for an office desk toy for mom or dad. A great Back To School item for the student who definitely knows a good novelty. 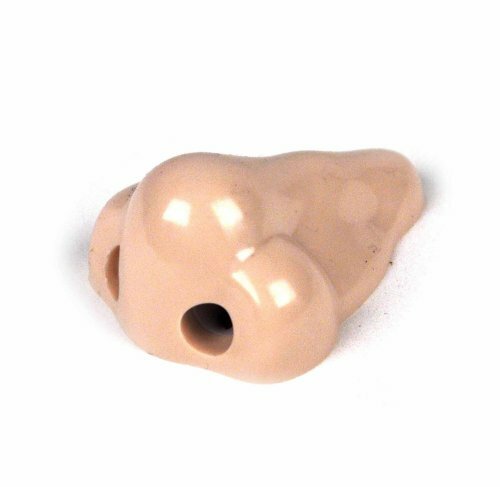 These unique pencil sharpener takes on the form of a human nose. Pencil Sharpener approximately measure 2 1/4 Inches. Fast and Powerful Motor:With heavy-duty and durable helical blade, fast sharpening for 3-5 seconds and auto-stop working at a perfect point to protect pencil lead and dispose of the broken lead intelligently. Fit for sharpening #2 pencils, colored pencils, charcoal pencils, etc. Auto & Safety Features:Automatically work when plugging the pencil into the shaving entrance. Auto-stop working if finished or the lid is opened. 8mm diameters shaving entrance could prevent kids' fingers from entering to avoid hurting. Large Capacity Design:You don't need to constantly empty the shavings reservoir as the capacity bin is large . You can go all day without emptying it.Electric Pencil Sharpener Heavy-duty stands up to the wear and tear of home, school and office use. Easy to Clean:Open the cover of the reservoir to pour out the pencil shavings when finished, not adding too much trouble. Our product provides Lifetime Guarantee, please contact us to get it fixed if it damages during the use. Hold the pencil sharpener with one hand and your pencil with another hand while sharpening pencils. Release hand pressure, and it will stop working. The blade is replaceable, you can buy an extra one if you want to replace the old. Kids-Friendly And Safe The pencil sharpener stops working when the shaving tray is removed. The safe lock prevents kids from hurting their fingers when using alone. Space-Saving The compact design and proper size make the Pencil Sharpener be a real space saver. It is also very portable, you can take it easy without any burden and hassle. USB or Battery Powered Our electronic pencil sharpener is powered by 2 AA batteries(Not included) or standard USB cord. To avoid the potential insecurity of plug-in for kids, the adapter is not included, but it is highly recommended that a 5V 1000mA adapter is used to get more strong power, which provides strong power sharpens for your pencil to a nice point only in 6-10 seconds. Fine Point The pencil sharpener comes with a sharp built-in blade, which is powerful enough to give a fine point for No. 2 pencils or colored pencils. Do hold the pencil with your hand to sharp after it's powered. This is not designed for not for crayons and eyebrow pencil. Quality Warranty 30 days unconditionally refund or free replacement in case of defective or any quality problems, life-time friendly customer service. Are you looking for an intelligent pencil sharpener that can help you handle any sharpening task? This is it - our compact, versatile electric pencil sharpener. Sharpen every pencil to the perfect point. Perfect for office, home and school use. Jelly Comb electric pencil sharpener is the best choice for you, no matter you are a student, teacher, artist, or business man. Engineered helical blade produces well-sharpened point every time, never get an uneven tip, never get stuck pencils,extended your pencil life. Only needs 3-5 sec. to sharpen. 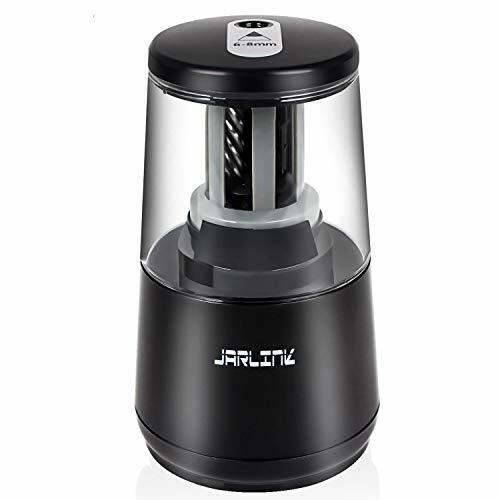 If any part of the assembly is missing, Jelly Comb electric pencil sharpener will stop working automatically, Your little kids can operate this sharpener with no problem. No safety issue, no risk of hurting the little finger. This electric pencil sharpener need 4*AA battery to get powered to work, which you don't have to worry about finding a place to plug it in. (Battery not included in the package). With a large shavings reservoir, no worry about the shavings going all over the place and so easy to clean. Sharpens colored and soft lead pencils with ease, Need a colored pencil sharpener? Need to sharpen No. 2 pencils? This is it! Engineering stainless steel helical blade can withstand 30,000,000 times of sharpens with no problem at all. Kids, students, teachers, artists, engineers, industrial designer, professionals and business people. Perfect for home, office and classroom use. A HANDY PERNCIL SHARPENER: The electric pencil sharpener with stainless steel helical blade is born to sharp your pencil a perfect point for drawing, writing, coloring; no uneven tips, no eat the pencil, premium quality and easy to use, a great helper to aspiring artist, driven student or working professional, specially designed for students, teachers, artists, professionals and business people. 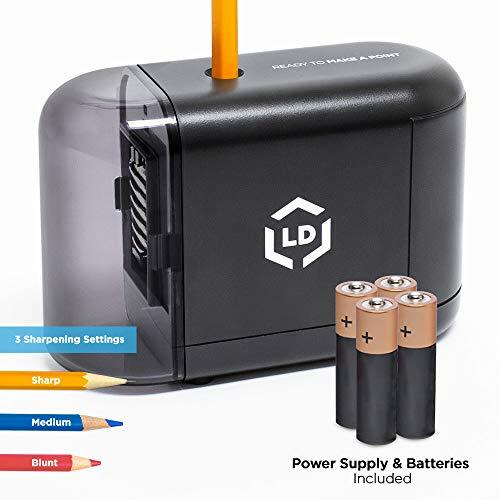 BATTERY POWERED & HIGH EFFICIENCY: This electric pencil sharpener is battery powered (batteries not included) and cable-free, It sharpens the color and soft lead pencil with ease in 3-5sec., a ideal pencil sharpener for No. 2 and colored pencils. 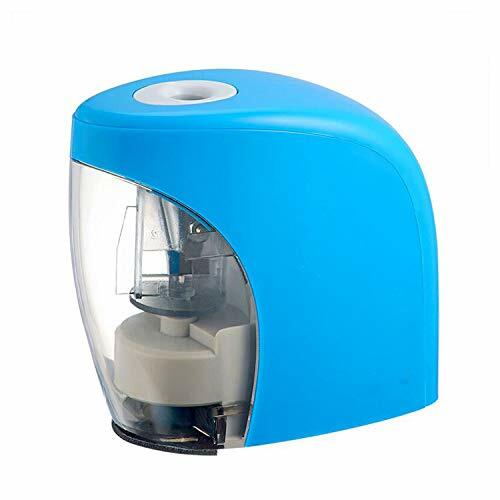 SAFETY & KIDS FRIENDLY: Designed with auto-stop mechanism, your little children can safely use this electric pencil sharpener as it will stop working automatically when the shaving cover is removed, no hurt of the fingers, a great classroom tool for your kids. EASY CLEAN & NO MESS: Having large capacity shavings reservoir, no worry about the shavings going all over the place and so easy to clean. 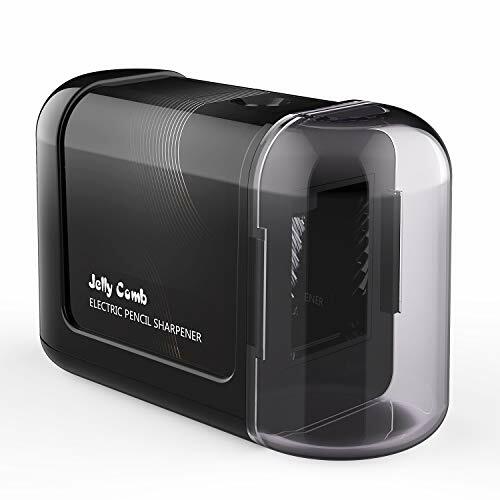 BUY WITH CONFIDENCE: We are so sure that you will love Jelly Comb electric pencil sharpener. If you don't like this pencil sharpener for any reason, Simply contact us to request a refund or exchange. We offer 100% satisfaction warranty, 30-day Money Back Guarantee, 100% replacement for defective items. 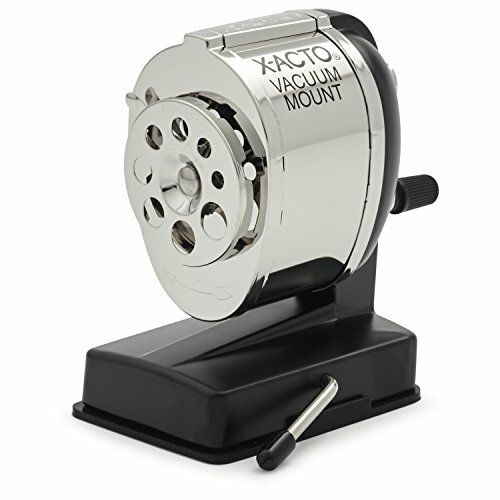 The X-ACTO KS Vacuum Mount manual pencil sharpener is a traditionally styled sharpener that suctions onto non-porous horizontal surfaces. This KS manual pencil sharpener includes an 8 hole dial pencil selector. Able to stand up to continuous, heavy duty sharpening, this manual pencil sharpener makes a great addition to a workshop desk or table. The KS model features a brilliant metal finish. Are you looking for the best pencil sharpener that sharpens 8mm pencils powerfully and perfectly ? for those who are drawing, coloring, writing at home, school, or office to get an perfect point. Fast and Powerful: Just 3-5 seconds to take it out with perfect tip. Pencil Specification: Work well for 8mm diameter pencils include triangular, charcoal, #2 pencils and art-grade wooden pencils. Heavy-duty Helical Blade : Heavy duty and durable helical steel blades sharpen pencils within 3-5 seconds and work well for 8mm diameter pencils. 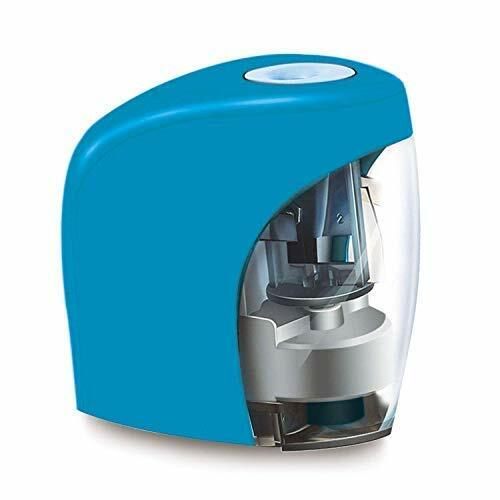 Safe for Kids: Auto Stop function prevents the colored pencil sharpener from operating once the cover is opened which makes it perfectly safe for children. Children can sharpen pencils without parents or teachers worrying. Perfect Power Options: 4 x AA batteries (not included), an AC adapter or a USB(not included . Portable and Compact: It's very small and portable which is easy to take it to everywhere. It won't take up much space on your bag, either. It performs better with AC adapter, but each way can give you a smooth cut quietly & quickly. Packing list:1 x electric pencil sharpener, 1 x manual, and 1 x AC adapter (USB and batteries not included). FAST & POWERFUL: Built-in reliable electric motor is quiet and powerful, which can make your #2 pencils and art-grade wooden pencils easy to sharpen. This premium quality pencil sharpener will make sure that you never have a "dull" moment at the office, school, home, or library! 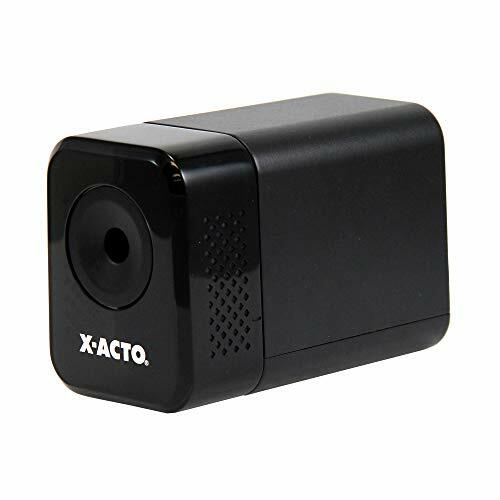 USB OR BATTERY OPERATED: This electric pencil sharpener is powered by 4 x AA batteries (not included), an AC adapter or a USB cable(not included). The best performance is achieved with AC adapter, but each way can give you a smooth cut quietly and quickly. Please note that battery operation of this pencil sharpener for kids would be disabled once the DC socket is plugged by AC adapter or USB, even if the AC adapter or USB is not connected. SAFE FOR KIDS & EASY TO USE: Safety features allow the battery operated pencil sharpener not to work once the cover is removed. This prevents kids and young children from hurting their fingers. The electric pencil sharpener will start sharpening 8mm pencils with pressing down the pencil. The pencil sharpener for kids will stop working when you take out the pencil from the electric pencil sharpener. DURABLE HELICAL STEEL BLADE: Electric pencil sharpener heavy duty sharpens pencils within 3-5 seconds and work well for 8mm diameter pencils. 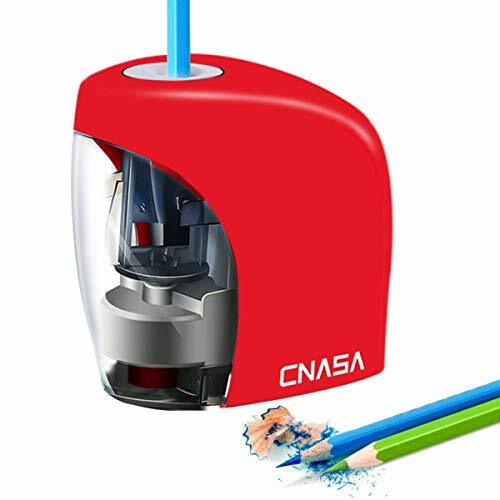 The automatic pencil sharpener with durable helical steel blade is perfect for students, teachers, artists, children, engineer and anyone who needs it. PORTABLE & EASY TO CLEAN: Each of our pencil sharpener small electric is compact and portable, which makes them a real space saver. Portable and minimal cord make the pencil sharpener easy to take anywhere. All shavings are conveniently caught in the shaving box and easily emptied by holding both sides of the shavings box and pulling gently. 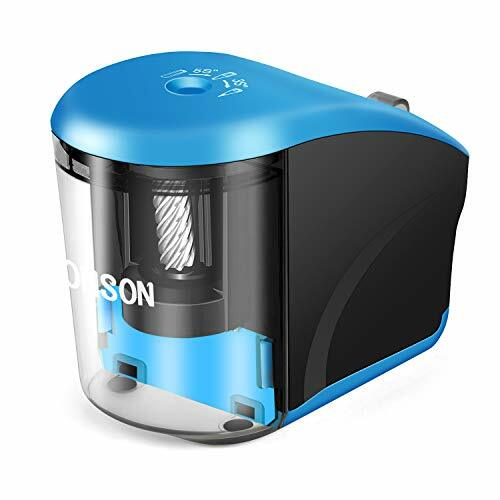 AUTO & SAFETY FEATURES ELECTRIC PENCIL SHARPENER The electric pencil sharpener will automatically work when plugging the pencil into the shaving entrance, automatically stop working once pull out the pencil or the shaving tray is opened. This function will protect your fingers from being injured by the blade. BUILD-IN HIGH-QUALITY HELICAL STEEL BLADE The helical blades of this electric pencil sharpener are stronger and more resistant than standard blades. You will get a perfect point pencil from fast sharpening about 5 seconds without chew your pencils and it will work correctly even after 4000 uses. LARGE CAPACITY DESIGN & NON-SKID FOOT PADS Large shaving bin prevents frequent emptying. 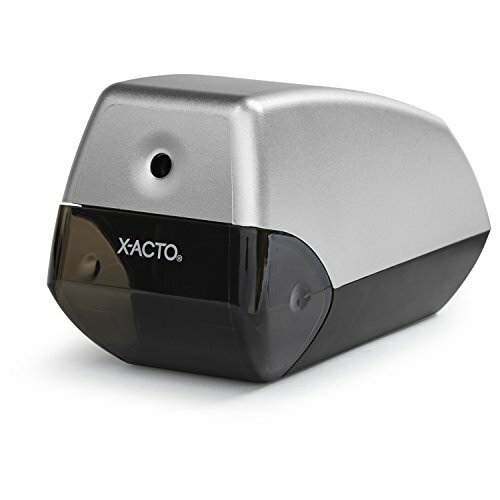 With non-skid foot pads, this electronic operated pencil sharpener handles #2, colored and charcoal pencils with ease which is great for teachers, artists, students and office workers. MULTIPLE POWER SOURCES Powered by 4 AA batteries (Batteries NOT Included) or USB. Flexible and convenient to use anywhere and easy to carry around. QUALITY ASSURANCE OF LIFETIME Tobeape electric pencil sharpener backed by a manufacturer warranty. We also offer extra cleaning brush and eraser as bonus gifts. If you are not satisfied, we're here to make thing right. Just click 'Add to Cart' now and get this pencil sharpener for your own, your friends or your families. If you are looking for an electric pencil sharpener that is easy to carry and safe to handle sharpening tasks, then our products are your best choice! This automatic pencil sharpener is designed for aspiring artists, students or work professionals. It's battery-powered (not including batteries), which means you can use it anytime, anywhere, without any burden. With its durability, this makes it your best choice! Be safe for your child! 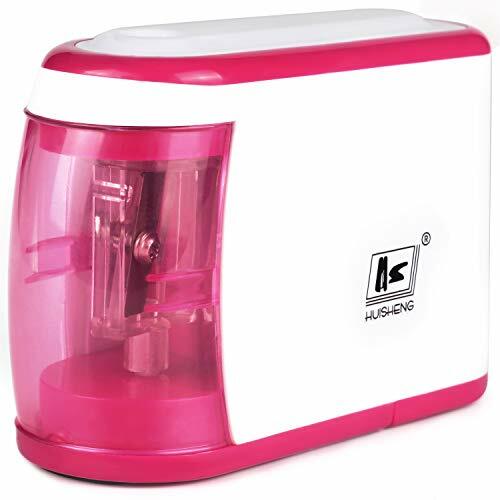 - Innovative automatic stop safety prevents the use of a sharpener when removing the lid. Large transparent shavings library - Rarely need to be emptied! Rotary auger design - Every time you're sure of the perfect point, you'll never get an uneven tip. very suitable - Commercial use, classroom, administrative use, suitable for desktop or office atmosphere, for personal and student use. We are very sure that you will like our electric pencil sharpener! If you don't like it, please let us know immediately and we will do everything we can to ensure your satisfaction! Power Sources Powered by 4 AA batteries (Batteries not Include). Flexible and convenient to use anywhere and easy to carry around. Powerful Motor The pencil sharpener comes with heavy-duty and durable blade, fast sharpening for 5 seconds and it's durable construction stands up to wear and tear. It is powerful enough to give a fine point for the pencils,never get an uneven tip. Auto & Safety Features Automatically work when plugging the pencil into the shaving entrance. Auto-stop working once pull out the pencil or the lid is opened. That means no risk for your fingers, which makes it an ideal choice for classrooms with your young kids. Compact & Portable Design Easy to transport. the combination between the beautiful design and the high-quality materials make it perfect for commercial use, classroom, executive use, desktop or office atmosphere.It is also an ideal choice for artists, students, professors, engineers, architects, and fashion designers of all ages, making drawing and writing much easier. Easy to Clean Replaceable blade make the electric sharpener easy to clean up.Just open the cover of the reservoir to pour out the pencil shavings when finished, not adding too much trouble. Our product provides quality guarantee, please contact us to get it fixed if it damages during the use. 1. Two AA batteries need to be inserted. The package does not contain batteries. 2. consider replacing the battery If the speed of pencil sharpener decreases or stops significantly. Is this case occur in your family? Children will require cut pencils when start writing homework. You will help them to sharp the pencil in order to let them get into the state of writing or drawing quickly. not pointed, laborious, dirty hands, not easy to use and so on. it will improve efficiency greatly. You will wonder which one is the best we can choose? Each part and detail is mixed very well, we made it based on the optimum tilt angle of the pencil, we just wanna creative a better pen-shaving experience for the child. May it's a particular way to let children fall in love with study. Who knows? A handy tool makes a handyman! Cute appearance and durable: press the start, it will stop automatically at a perfect point, then you will see the pencil is cut smoothly, the force is even, it is not easy to break the lead core, save the pen loss, save time, complete the work in a few seconds from the beginning to the end, improve effectiveness intelligently. 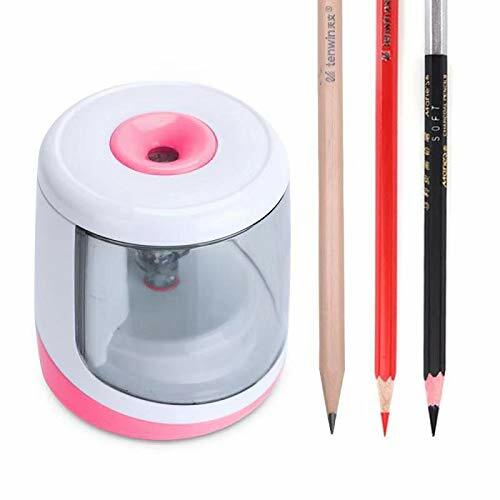 The blade is sharp and safe, the tool holder can be replaced this increase the long life of the pencil sharpener.Suitable for all regular pencils with a diameter of 6-8 mm, lead pencil,colored pencil,charcoal pencil, satisfy students and teachers with homework, writing and drawing. It's the perfect gift for children especial for these who love painting. on another side you can take this is as a study chance with children and you are the best friend during the process. Order it now! you can get a full refund just by returning the goods if you have any reasons or quality problems that you don't like within 30 days,! We have enough confidence in this pen sharpener.